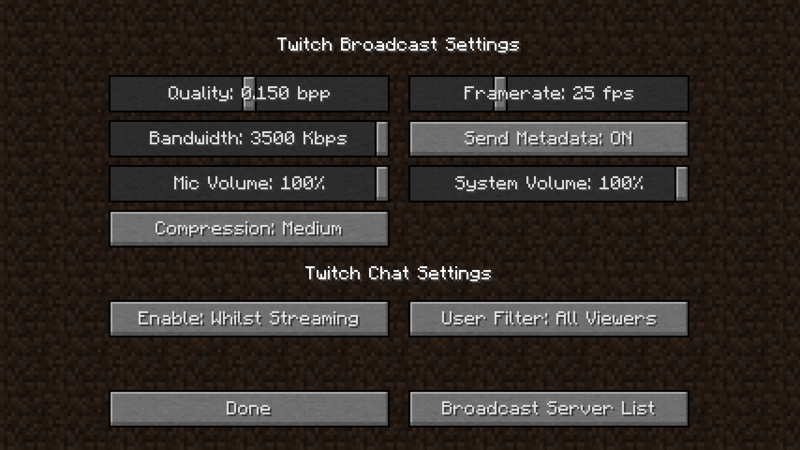 1.7.4 is an update which included – among other things – a new Mojang splash screen, Twitch.tv broadcasting and the Chicken jockey. While it was not the last update to 1.7, it was the last one before the snapshots of 1.8 started. Twitch chat integration in the game. Consist of a baby zombie riding and controlling a chicken. Because the zombie is riding a chicken, it cannot take fall damage. As it is a baby zombie, it will not burn up if exposed to daylight. Extremely rare - every baby zombie spawned has a very small chance of spawning as a chicken jockey. Zombie pigmen chicken jockeys can spawn in the nether. The logo has been changed so now it's red instead of red-orange, has 2 square corners, and the rounded corners are rounder. The text is now black instead of orange, the font weight is lighter (bold instead of black), and the face appears to be a custom hybrid of Insignia and Code pro. Mojang splash screen can no longer be changed in resource packs. Servers now have an icon which is the face of the owner's skin. Config screen is modified - layout changed. The sharpness enchantment now affects the "attack damage" attribute. When dismounting entities players are no longer moved as far. If all auto-completable options begin the same, tab will fill up the beginning - Example: /gamerule doM completes to /gamerule doMob. Advanced OpenGL option in "video settings" was removed. Sheep with the custom name "jeb_" change their color, fading between all 16 wool colors. Commonly referred to as "rainbow sheep", "disco sheep", or "Jeb sheep". Color changes are visual effects only; does not affect wool drops. Η σελίδα αυτή τροποποιήθηκε τελευταία φορά στις 14 Νοεμβρίου 2018, στις 00:03.